In a world of instantaneous and cheap gratitude it should behoove you to take a step back and breathe. Not all needs to be instant with a flick of a finger or a command by voice. Some processes are meant to take time. Pace is no longer valued but when it is used, conscious care is taken and a project is given proper respect it tends to grow into something more. Those of us who choose to delve into less certain outcomes that shooting film is canny for have an understanding for this, photography for us isn’t caught up in pixels rather bound to our negatives and this drive to create something more is the basis of this book. In the past years gratification for the modern day photographer is shallowly quantified by a post that will be seen as an image no bigger than your palm in hopes that a satisfactory amount of people will spend about a second looking at it before tapping the like button or even better giving you their following. Our work should be treated with more respect, let it evolve for its self past its infant stage and become something cohesive and tangible. “Taco Tuesday” a collection of images that have been compiled over a stretch of a few years triggered by receiving a Nikonos V as a gift from a friend. Shortly after the move west, Erik found himself on the doorstep of the ocean where a couple days of learning how to swim in waves turned into one of his most desired activities and now a mainstay when the waves get good. The imagery is an honest reflection of one’s first foray with early mornings chasing waves to late nights blowing off steam in a sundrenched Southern California. 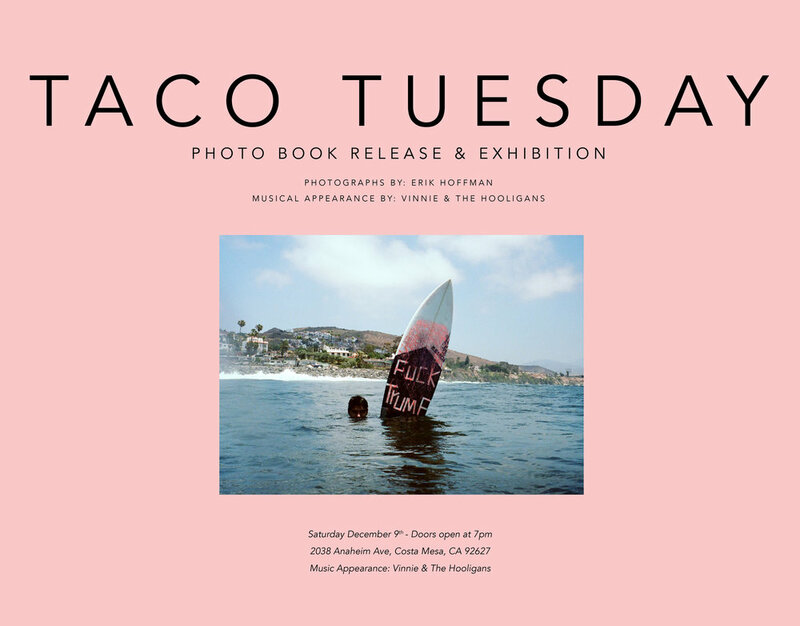 Come on down to 2038 Anaheim Ave Costa Mesa, CA 92627 at 7pm on Saturday December 9th for a good photos, a good hang and a musical appearance by our buddies in Vinnie & The Hooligans.